Our first full day at sea, and it was one that isgoing to hard to beat. It seems we hit the large-whale jackpot thanks to our biologist Lisa Steiner and our Skipper Nuno. 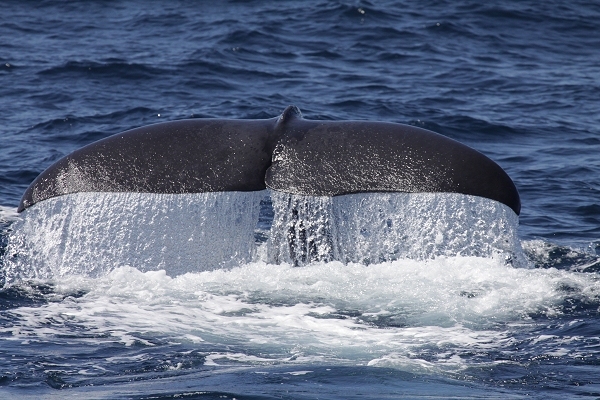 Today’s sightings included sei whales, fin whales, blue whales and…a sperm whale! Almost all of our encounters were “random” (meaning not reported by the on-shore lookouts, but rather by us while on the water.) Sarah took excellent photographs and we were able to confirm that we saw the same groupings of fin whales in two separate locations. Tomorrow we’ll check our identification photographs against an international database to see how far and wide “our” whales have travelled. Martin was our hero today when he heard the sperm whale clicks through the headset just after we’d given up and started pulling in the hydrophone, so we all got a chance to hear what a sperm whale sounds like as it dives. We also saw a grouping of 75 common dolphins just outside of the harbour. Update from our volunteer vacation / conservation holiday protecting whales, dolphins and turtles around the Azores archipelago.